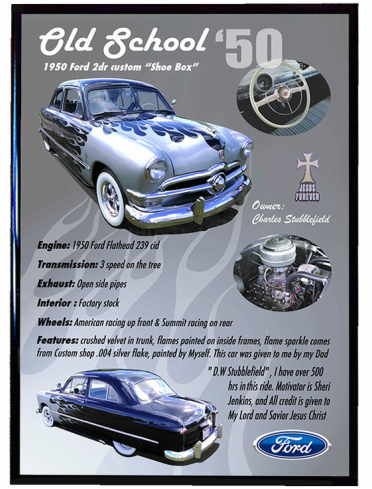 Street Rod 101 manufacturers and sells the most versatile and highest quality car show display stand available. 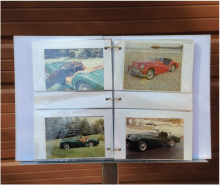 BUY A "CAR SHOW DISPLAY STAND"
Great gift for the holidays or birthdays. Display Stand held in place by the vehicle wheel, and viewed from the front of the vehicle. Display Stand held in place by the vehicle wheel and viewed from the side of the vehicle. The above photos show how the base plate is positioned under the wheel, how the center posts are placed, and how the thumb screws look. The four parts of the Car Show Display Stand fit neatly in the Carrying Bag. Add this photo album/iPad bar for the display stand to display a traditional or electronic photo album, using an iPad or tablet. A portable, versatile, and durable “Car Show Display Stand” for car, truck, motorcycle and other recreational vehicle shows, including auto dealerships and auto museums. Includes four parts that assemble and disassemble quickly with slip joints. Thumb screws are included on the slip joints for increased stability. No tools needed. Also, a carrying bag is available for protection during carrying and storing. 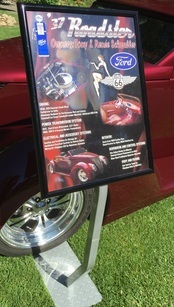 The car show display stand fits easily behind the seat of a street rod, hot rod, or another classic car. Held firmly in place with one of the vehicle wheels. Two heavy duty industrial strength tape strips hold your sign to the sign plate of the car show display stand. The tape strips are a loop and hook fastening technology. Two, 4-inch strips, 1 inch wide are used. One side of each strip has a very sticky side. The sticky side is attached to the sign plate. The other strip sticky side is attached to the back of the sign. Once put together, the loop and hook technology holds most any size sign to the sign plate very effectively but can be removed readily. Good in outdoor shows and in very windy conditions. 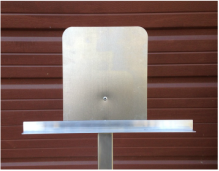 To see instructions on how to attach your sign to the sign plate, click here. A photo album/iPad bar for the display stand is also available so you can display photos of your vehicle. Sign and or photo album (iPad) NOT included. Comes with parts powder coated super silver (metallic) finish or flat black finish. Powder coating finishes are more durable, maintain color better, and are exterior grade paints. Note that the base plate is polished aluminum. Carrying bag material… 18 oz. coated vinyl. Weight in carrying bag……9 lbs. 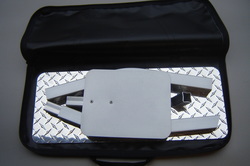 Dimensions of base plate...23" X 9" X 1/8"
back, or side of vehicle. boat shows, and RV shows. --Also great for outdoor shows in windy conditions. Click here to see photos of how the Car Show Display Stand is being used by a few of our customers. Standard shipping and handling (boxes, paper, tape, bubble wrap) in the lower 48 states are as follows: Car Show Display Stand--$23.00. Seller is not responsible for added shipping fees to Canada, Hawaii, Alaska, and international locations. No additional charges (shipping) for the Carrying Case/Bag or Photo Album Bar if ordered with the Car Show Display Stand. 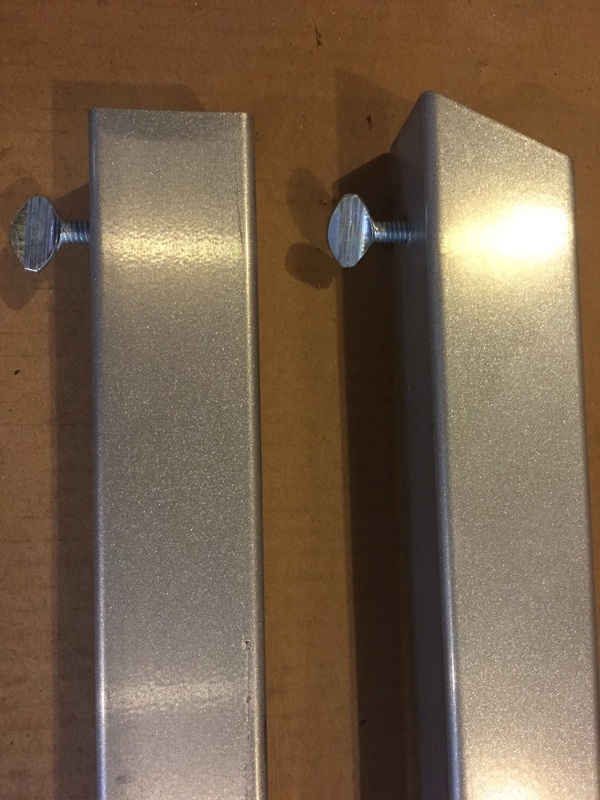 If you have two different signs that you use for your display, you can order an extra upper sign plate and use the original stand posts and base plate. Comes powder coated only in super silver finish. $43.00 when ordered with the stand. If ordered separately, shipping costs will be added. “Second one I've purchased - Outstanding quality!! AAAAA+++++”-------“Awesome stand and fast shipping”-- “Quick response and fast shipping…Perfect,------- THANKS! !”-“Outstanding product. Quick shipment. AAAAA+++++ Thanks”------“This is a great display stand…quick delivery. Thanks.”-------“Very, very nice car show stand. I have been looking, and this is the BEST”-----"UPS just dropped off the display stand and it looks awesome"------I will make sure everyone knows where I got it from and how to get one of their own." --------"Just what I've been looking for." --------"Great in windy conditions." ---------"I really love the looks and design of this stand, and from all the browsing I did, yours seemed to be the highest quality, and by far the best design!-------Very nice product, thank you very much. Very happy customer. Don't have a sign yet? 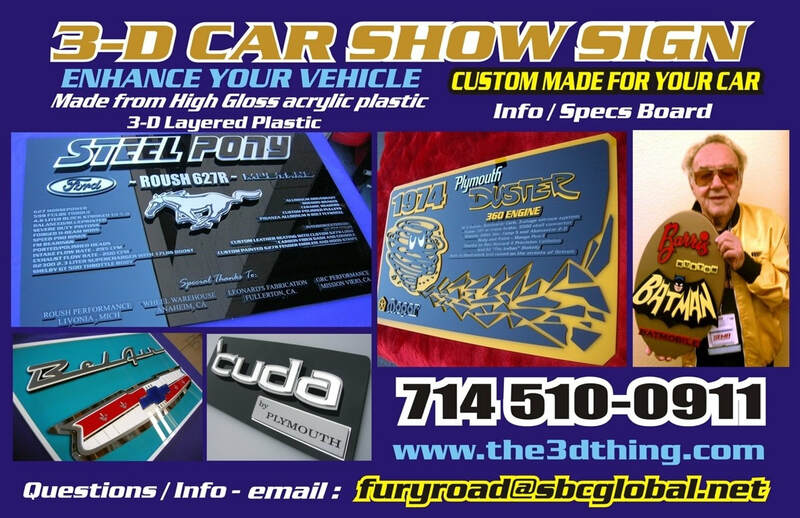 Check out any of the following great companies below to help you make a quality sign for your Car Show Display Stand. Contact them, and then send them the information and photos you want on your sign. They will take it from there. Don't have a sign yet? 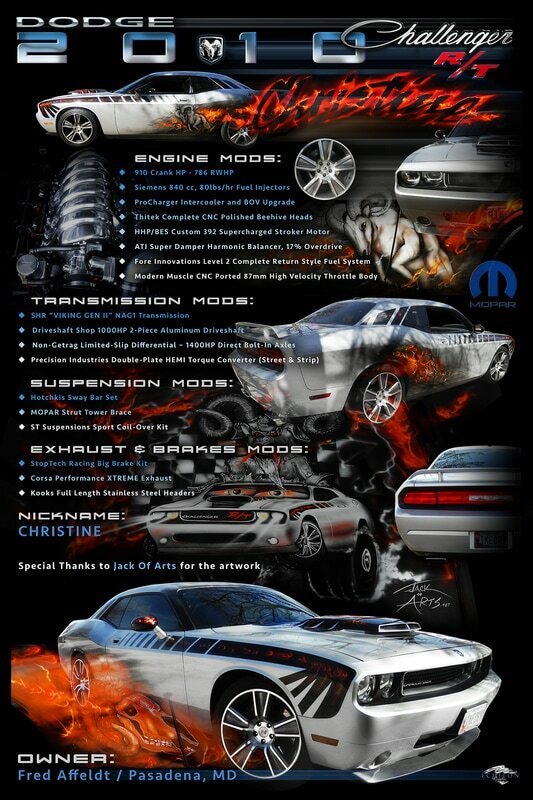 Check out AutoshowArt. They can help make a sign for your Car Show Display Stand. Below are two examples of the quality of their work. Don't have a sign yet. Check out MAS Industries Inc. They can make a quality sign for your new Car Show Display Stand. Below is an example of their work. If interested, contact Jenny Brockway at jbrockway@mas-ind.com or call at 1800 528-1931. Don't have a sign yet? Check out Troy Kruger's work at Custom Show Boards in Minneapolis, MN. They can help you make a sign for your Car Show Display Stand. See the two examples below of their quality work. Don't have a sign yet? Check out Echelon Graphix. 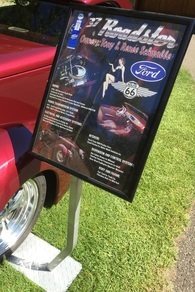 (Jonathan Nickens, echelongraphix@msn.com, 509-876-4444) They can help you make a sign for your Car Show Display Stand. See the several examples of their quality below. For more examples click on the BLOG and scroll down to Echelon Graphix.